Mount Tzouhalem is located in the backyard of Duncan (North Cowichan), BC, on Vancouver Island. It is located on municipal forest land, and part of it is an 18 acre Ecological Reserve. From the summit, you can see Saltspring Island and the Coast Mountains. The mountain was originally named ‘Shkewetsen’, meaning ‘basking’, or ‘warming in the sun’, by the local Cowichan First Nations. The mountain was later named after a Quamichan chief who lived on the side of the mountain after being banished by his own people. Born of a Quamichan man and a Comiaken woman, Tzouhalem was trained to be a warrior by his grandmother. He was infamous for his combative and unruly behaviour. In the mid-1800s, the mountain was used as a target for the Royal Canadian Navy HMS Trincomalee’s cannons. On April 26 of this year, the mountain was used as a target for the Friends of Ecological Reserves’ Canons. Things change…and so pictures were taken; scads of them. And it was plain to see why: Winding past a plethora of recently built homes perched on the northern slope of Mt. Tzuhalem, you suddenly encounter a gravel parking lot surrounded by monumental Douglas fir (Pseudotsuga menziesii) trees. Several trail-heads beckon. Exuberant youth on mountain bikes launch out of the forest and into the parking lot. Dogs abound. Bird watchers and plant nerds and nature lovers glint in the dappled sunlight. Every person who uses the park seems happy…excellent common ground. Cameras are primed and introductions are made. Our hosts for the day are Genevieve Singleton and David Polster, who care deeply for the remaining wild spaces in the Cowichan Valley. They are like loving parents and the Mt. Tzuhalem Ecological Reserve (ER) is their child. They are understatedly proud to show it to us, and yet they worry that it may be damaged. Urban encroachment, wear and tear from park users, creation of new unintended trails, illegal harvesting, invasive species and climate change threaten the reserve’s health. I feel blessed to be here, despite these woes. We start down a path at the western end of the parking lot, destination: the Mt. Tzuhalem ER, which is a seemingly short distance of 200 metres from the parking lot. We don’t make it very far. If you have ever tried to hike with a troop of biologists, you will understand why. Every plant, every blossom, every fungi, every shard of lichen, every bird call, every flutter of every wing in every shrub must be examined. Keep in mind, this is only a small exaggeration. We are greeted by western coral root (Corallorhiza maculata) and the nodding heads of the last of the fawn lily (Erythronium oregonum) show. Pacific slope flycatchers (Empidonax difficilis) whistle for us to approach. Amanita mushrooms hunker down in the shade, and the ocean spray (Holodiscus discolor) is preparing to make its flowers. The air is clear and sweetly earthy with the tang of Douglas fir essence. We slowly flow into the forest, enjoying the journey. The trail winds through Douglas fir dominated slopes, rising up to a rocky plateau. Subtle signage reminds park visitors that they have entered the Ecological Reserve. By definition, ERs are meant to protect examples of rare, endangered or unique ecosystems. Sometimes, human intervention is needed so that ecosystems remain as they are, and evidence of this is visible in the Mt. Tzuhalem ER. One of the first things that you will notice is an abundance of girdled Douglas fir trees within the Reserve. Because Mt. Tzuhalem ER is considered a prime example of a Garry oak (Quercus garryana) woodland, the Douglas firs have been ‘sacrificed’, in order to keep it that way. Without removal of the Douglas fir, the trees would eventually come to dominate and the Garry oak woodland would disappear. It is a hot button issue, and muted discussion takes place among some of the visitors. Many Garry oak meadows exist because of anthropogenic manipulation: First Nations regularly burned these ecosystems in order to enrich and maintain associated camas gardens. Any Douglas fir trees and encroaching shrubs would be lost in the fire. Oaks and annual wildflowers, grasses and bulbs would emerge anew the following spring. Those who agree to Douglas fir girdling argue that it is no different than prescribed burning because both are intentionally carried out by people. As we can no longer burn the Garry oak meadows due to fire containment issues, girdling is the new ‘torching’. On the other hand, those who disagree with Douglas fir girdling feel that it is unethical to select for one species over another and as such, succession should be allowed to take place, even if it means losing Garry oak ecosystems. For now, at least, regardless of which side of the debate you are on, if you walk through the split rail fencing that borders the Mt. 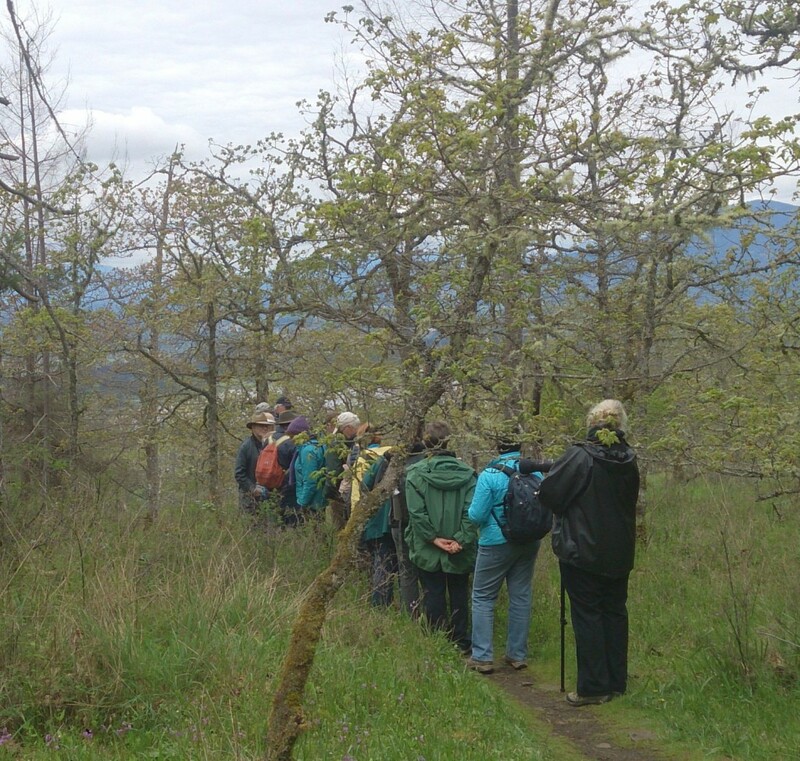 Tzuhalem ER, you will be greeted by a breath-taking vista of wildflowers and crooked oak trees perched high above the Cowichan valley below. It looks and feels as though you have just stepped into a painting. The shallow soil is dominated by blazing magenta seablush (Plectritis congesta) blending beautifully with the rich purple of camas (Camassia quamash) and the vibrant yellow of the spring gold (Lomatium utriculatum) and western buttercup (Ranunculus occidentalis). A mountain-goat-esque path meanders gently through the rich carpet of herbs. There are shooting stars (Dodecatheon sp. ), Menzie’s larkspur (Delphinium menziesii), death camas (Zygadenus venenosous) and Pennsylvania sedge (Carex pennsylvanica). Here and there, a chocolate lily (Fritillaria lanceolata) makes a cameo appearance. 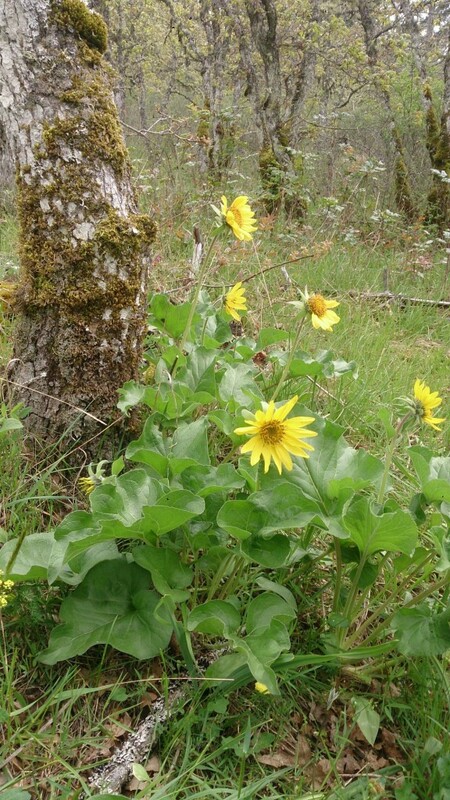 And tucked away in a gentle pocket of sloping green, there is a small huddle of the mountain’s own sunflowers: the elusive and stunning deltoid balsamroot (Balsamorhiza deltoidea). Its shocking yellow rays contrasted sharply against the surrounding emerald stems and the ashen oak bark. It seemed as if it purposely chose the spot in which it grew. Up on top of Mt. Tzuhalem, there was not a spot you could look without feeling a stirring of awe. It truly is a special place, and it is definitely worth an attentive hike. Mid to late April offers prime wildflower viewing. Following our tour of Mt. Tzuhalem ER, our wonderful hosts had a final ace up their collective sleeve: we caravanned down into the valley to an area near Quamichan Lake. 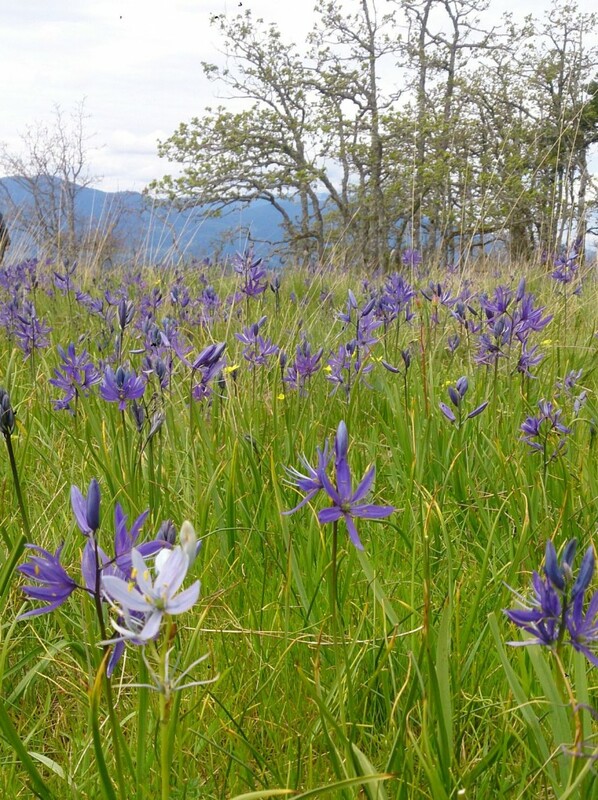 This area offers a contrasting example of a Garry oak meadow on deep, rather than shallow, soil. The oaks are massive, and belong in the romantic scene of a dewy love story. Tall and thick, the deep soil Garry oaks have long down-arching branches and spectacular shapes. This is the site of a Western Bluebird (Sialia mexicana) reintroduction effort, the ‘Bring Back the Bluebirds Project’, which is led by the Garry Oak Ecosystems Recovery Team (GOERT). There are currently 18 adult Bluebirds, six of which are breeding pairs, with a total of 16 nestlings. The birds are supplemented with insect food on feeding platforms, and there are several nest boxes perched in the surrounding Garry oak trees. We are fortunate, and see a few male Western Bluebirds; their cobalt wings and ruddy breasts and shoulders are lovely, and shine in the sun like a tropical sea. Western Bluebirds were reintroduced to the Cowichan valley in 2012, nearly 20 years after one was last seen in there in 1995. They are translocated from a healthy population in Washington State. The birds seem to be making a tenacious foot-hold in the valley, and have been spotted in Duncan, Metchosin and on Mt. Tzuhalem. On a clear day, you can see Mt. Baker, in Washington State, from the top of Mt. Tzuhalem; perhaps the Western Bluebirds pay a visit there so they can peek at their old home, and, at the same time, delight in their new one.